The central, endlessly repeated lie (upon which the great wind power fraud rests) is that increasing wind power generation results in decreases in CO2 emissions. In Australia, the central object of the Renewable Energy (Electricity) Act 2000 is for “renewable” energy to “reduce emissions of greenhouse gases in the electricity sector” (see s3). But, somewhere along the way, what was a CO2 abatement scheme became an industry subsidy scheme which is nothing short of “corporate welfare on steroids” (see our post here). At no point since that legislation took effect over 13 years ago has the wind industry provided any actual proof that it has in fact reduced CO2 emissions in the electricity sector. When we talk about “proof” we’re not talking about smoke and mirrors “modelling” based on long-term average wind farm output – which ignores the extra gas and coal being burnt (and wasted) in order to balance the grid to account for wild fluctuations in wind power output (see our post here); and to maintain additional “spinning reserve” (see our post here) to account for complete collapses in wind power output – as seen in this post. As we have pointed out just once or twice – the need for 100% of wind power capacity to be backed up 100% of the time by fossil fuel generation sources means that wind power cannot and will never reduce CO2 emissions in the electricity sector (see our posts here and here and here and here and here and here and here). STT is happy to go all out and say that in Australia wind power requires 100% of its capacity to be backed up 100% of the time by conventional generation sources. As just one recent example, on 3 consecutive days (20, 21 and 22 July 2014) the total output from all of the wind farms connected to the Eastern Grid (total capacity of 2,952 MW – and spread over 4 states, SA, Victoria, Tasmania and NSW) was a derisory 20 MW (or 0.67% of installed capacity) for hours on end (see our post here). The 99.33% of wind power output that went AWOL for hours (at various times, 3 days straight) was, instead, all supplied by conventional generators; the vast bulk of which came from coal and gas plants, with the balance coming from hydro. For wind power to reduce CO2 emissions in the electricity sector it has be a true “substitute” for conventional generation sources. Because it can’t be delivered “on-demand” (can’t be stored) and is only “available” at crazy, random intervals (if at all) wind power will never be a substitute for conventional generation sources (see our post here). Perhaps the reason that the wind industry has never produced a shred of evidence to show that wind power has reduced CO2 emissions in Australia’s electricity sector is simply because it can’t. Running counter to wind industry claims about wind power abating CO2 emissions, the result of trying to incorporate wind power into a coal/gas fired grid is increased CO2 emissions (see this European paper here; this Irish paper here; this English paper here; this American article and this Dutch study here). This American study details just why increasing wind power capacity – and trying to incorporate its wildly fluctuating output into a coal and gas fired grid – results in increased CO2 emissions across the electricity sector. 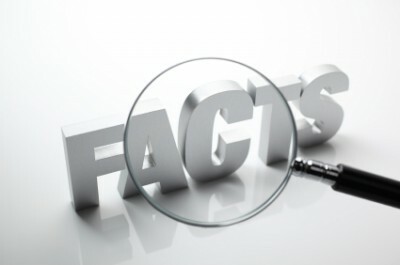 Many claim that wind generation is beneficial because it reduces pollution emissions and does not emit carbon dioxide. This isn’t necessarily the case. The following article explains a phenomena called cycling where the introduction of wind power into a generation system that uses carbon technologies to back-up the wind actually reduces the energy efficiency of the carbon technologies. Recent studies with actual data have estimated the impact of cycling on air pollution and carbon dioxide emissions. Energy modelers evaluating the impact of legislation such as Senator Bingaman’s American Clean Energy Leadership Act and the American Power Act proposed by Senators Kerry and Lieberman should take note for their models most likely are underestimating the cost of compliance by incorrectly modeling the integration of wind power into the electricity grid. Wind is not a new technology. It was one of our principal sources of energy, along with wood and water, prior to the carbon era. 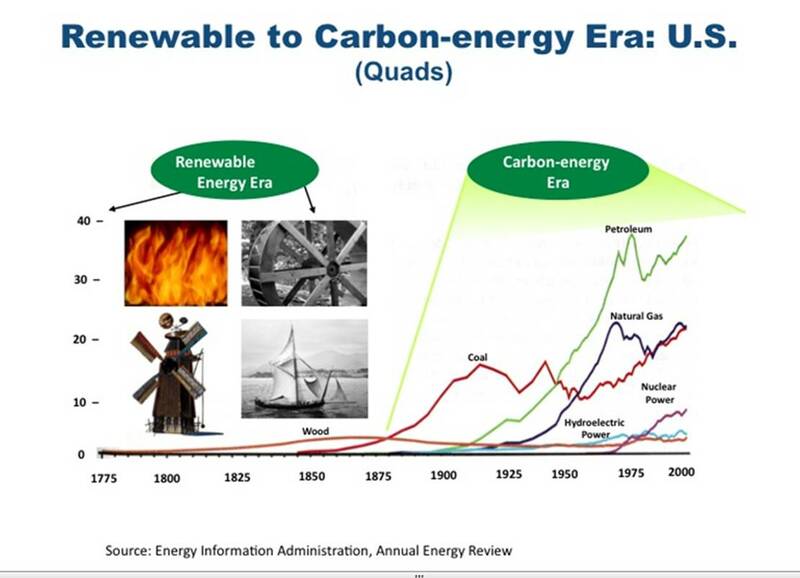 But the use of renewables in the pre-carbon age was very different from the current use of renewables. Today, people rely on energy being available 24 hours a day, 7 days a week, 365 days a year, regardless of whether the sun shines, the wind blows, or there are high or low water levels. We now have over 1,000 gigawatts of generating plants, and a large and elaborate electrical grid that requires great coordination among system operators to avoid disruptions. Also, in the pre-carbon energy era, when renewables were the sole source of energy, there were no coal-fired or natural-gas fired power plants to provide back-up power. Studies have found that the efficiency of those carbon-based plants is affected by incorporating wind energy into the system. When a plant’s efficiency is reduced, its fuel consumption and emissions increase, causing unintended consequences that wind proponents do not disclose. Requiring even larger amounts of renewable energy through renewable portfolio standards will only exacerbate this problem. Our various electricity generating technologies were designed and constructed to meet electricity demand based on their best operating characteristics for meeting portions of the electricity load duration curve. The load duration curve illustrates periods of constant demand that are served by base-load power versus periods of intermediate and peak demand. Owing to their high capital cost, low fuel cost, and high capacity factors, technologies such as coal and nuclear were designed to operate continuously to meet the base-load demand component. Owing to their lower capital costs but higher fuel costs, natural gas technologies, including combined-cycle and turbine plants, were designed to meet intermediate and peak electrical load. Wind is an intermittent technology since it can generate power only when the wind blows. Its low operating cost (with no fuel component) and the mandates of state Renewable Portfolio Standards (RPS) make it practically a “must take” technology for system operators. RPSs require that a certain amount of electricity generation be produced by renewable fuels. The renewable target mandates tend to start out low but increase over time, with those of most RPS states reaching 15 to 30 percent by 2020 or 2025. Wind tends to be the primary technology for meeting RPS targets, since it is lower in capital cost than solar, thermal, and photovoltaic technologies, the other politically acceptable “green” technologies. Part of the rationale for introducing RPSs is that the substitution of “green” technologies for carbon technologies is supposed to reduce pollution emissions as well as carbon dioxide emissions. However, studies have shown that this may not be the case. As conventional generation (coal or natural gas) is reduced to make room for wind generation and is then increased as wind generation subsides, its heat rate rises. The heat rate is a measure of a generating station’s thermal efficiency commonly stated in units of Btu per kilowatt-hour. This reduction in efficiency increases its fuel consumption and emissions. When sudden increases or decreases occur in generation output, it is referred to as “cycling”. Bentek did a study of the results of integrating wind into the generation mix of the Public Service Company of Colorado (PSCO), using data from the company’s financial reports, the Energy Information Administration, the Federal Energy Regulatory Commission, the Environmental Protection Agency, and the National Renewable Energy Laboratory. PSCO is a largely coal-fired utility with 3,764 megawatts of coal-fired generators, 3,236 megawatts of gas-fired combined-cycle and gas turbine capacity, 405 megawatts of hydro and pumped storage capacity, and 1,064 megawatts of wind generators. Colorado has an RPS that required 3 percent of the electricity generated by investor-owned utilities come from qualifying renewable technologies by 2007, and 30 percent by 2020. 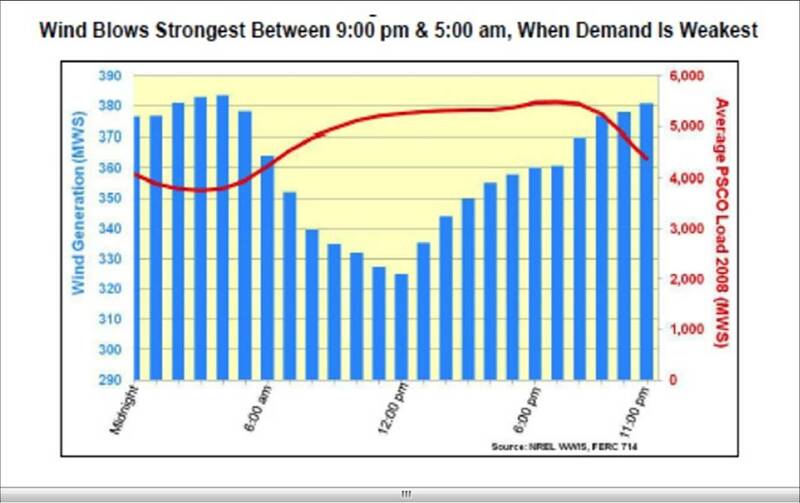 Colorado’s energy demand is highest during the day, peaking in late afternoon or early evening. Wind generation, however, is greatest between the hours of 9 pm and 5 am; it cannot be counted on to provide power when most needed, and so is used when available to meet the RPS. Most of the time that wind generation is available, it backs out (or replaces) natural gas. However, there are times when coal generation, which provides over 50 percent of PSCO’s base-load generation, is backed out to make room for the wind generation. When this happens, coal generation is cycled, causing its heat rate to increase and resulting in more fuel consumption and emissions. 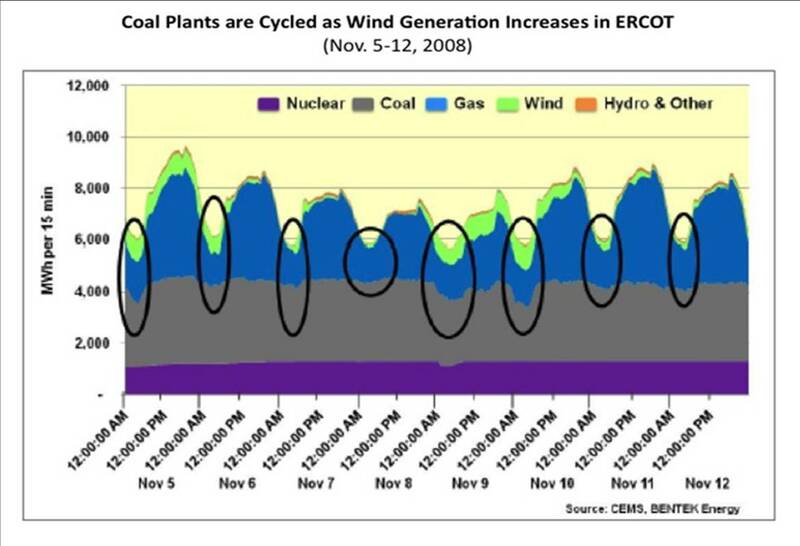 In PSCO, coal cycling predominates because of the low amount of gas generation in the system since most of its gas-fired generation is from turbines and because wind is strongest at night when coal use is even more pronounced. In the Denver non-attainment area, PSCO has 4 coal-fired plants: Arapahoe, Valmont, Pawnee, and Cherokee. Between 2006 and 2009, these coal-fired plants have experienced higher emissions rates ranging from 17 to 172 percent higher for sulfur dioxide, 0 to 9 percent higher for nitrous oxide, and 0 to 9 percent higher for carbon dioxide. In 2008, Cherokee even switched to a lower sulfur coal, but still ended up with sulfur dioxide emissions higher by 18 percent. And, between 2006 and 2009, these plants reduced their generation by over 37 percent, exacerbating further the increase in emissions. Because the PSCO data are limited, Bentek checked their results against data from the Energy Reliability Council of Texas, whose utilities are required to report generation levels by fuel every 15 minutes. Texas has the most wind capacity in the country—over 9,500 megawatts. Texas also has an RPS that was instituted during George W. Bush’s governorship and that pushed Texas ahead of California in wind capacity during 2006. The Texas renewable portfolio standard requires that utilities have 5,880 megawatts of renewable capacity by 2015, including a target of 500 megawatts of renewable-energy capacity from resources other than wind. The legislation also set a target of reaching 10,000 megawatts of renewable energy capacity by 2025, although it will be exceeded much earlier. However, even in Texas, which has a large natural gas–fired capacity base, with over 40 percent of its generation being natural gas-fired, coal-fired generation is cycled as is shown in the graph below. Another benefit that wind power generators get is that their forecast power generation entails no penalty if it is not available. Other generators must provide their own back-up power if their generation is suddenly unavailable. But the owners of wind generators believe that they can’t be held accountable for whether the wind blows and thus for inaccuracies in their forecasting capability. For example, on February 26, 2008, a cold front moved through West Texas and rendered wind’s output 1,000 megawatts less than promised, and that unexpectedly had to be made up by other generating technologies. Only careful and extensive coordination, such as was carried out in West Texas on that cold February day, can prevent brown outs and black outs from occurring. Two researchers, C. le Pair and K. de Groot, found that the Netherlands government was overestimating the amount of carbon dioxide reductions associated with wind production. The government was using incorrect data because it did not correct for the reduction in efficiency of the conventional power plants once wind was introduced into the system. Using data provided by CBS, the Dutch Institute for Statistics, the researchers made an estimate of the “turning point” where the efficiency reduction of conventional power plants balances out the fuel savings from wind energy. Using data for 2007, when wind power was at 3 percent, they found the turning point to be at an efficiency reduction of 2 percent based on all the power stations serving the Netherlands. That is, when the efficiency of the back-up plants was reduced by over 2 percent due to cycling caused by the integration of wind energy into the system, fuel use and emissions of the back-up plants increased. An engineer, Kent Hawkins, evaluated several heat rate simulations to represent cycling of the plants when wind is introduced into the system. One set of simulations evaluates wind energy replacing coal power with different technologies serving as the back-up power to wind, in order to evaluate their effect on fuel use and carbon dioxide emissions. He found that because of cycling, carbon dioxide emissions increase with the incorporation of wind energy if coal is the sole back-up power for wind. If coal and gas turbines or gas combined-cycle and gas turbines are used to back up the wind power, carbon dioxide emissions are reduced mainly due to the lower carbon dioxide emissions produced from natural gas generators as compared to coal generators. 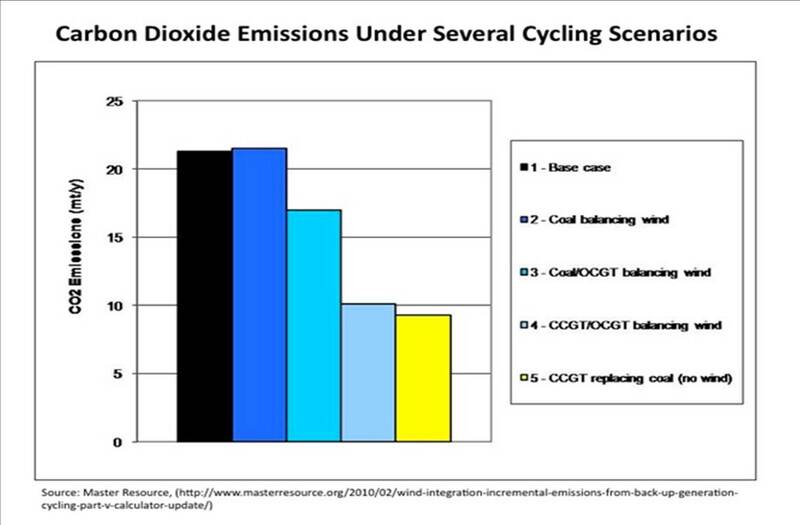 This is best seen by examining the last bar in the chart below where the lowest carbon dioxide emissions result when natural gas combined-cycle plants are solely used to replace coal. An interesting consequence of this analysis is that certain areas of the world where wind is integrated into a system that is primarily coal-based may result in an increase in total carbon dioxide emissions from using wind in their generating sector. That is, in these circumstances, wind would not be providing an offset in carbon dioxide emissions, but would actually be providing an increase in those emissions. China, for example, relies on coal for 80 percent of its generation and natural gas for only 2 percent. China also added the most wind power of any country in 2009, 13 gigawatts, ranking third in the world in total wind capacity, with the United States first and Germany second. Since China’s wind would primarily be backed up by power from coal-fired generating units, it is no wonder that China’s carbon dioxide emissions increased by 9 percent in 2009. As more wind units are built and data become available regarding their integration into conventional energy systems, we will learn more about the effects of wind units on the operation of conventional plants. A few studies have been done showing that the effect of wind integration on both fuel consumption and emission reductions can in fact be negative. Further evaluation of our current wind units and their effects on fuel consumption and emissions should be done before increasing the penetration of renewable energy to the 20 and 30 percent levels currently mandated by some state renewable portfolio standards, and before a national renewable portfolio standard is considered for enactment. 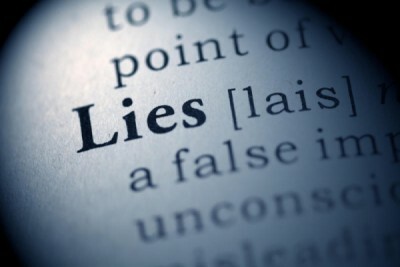 What brings the great wind power fraud to an end. Follow the UK. and Germany to see how useless and costly these things are, June and July 2018 almost no output in the UK. from wind power. Does not even consider life cycle costs: wind turbines wear out and have to be replaced. Makes one wonder if the energy invested in fabrication and installation is repaid before the wind turbine needs to be replaced. If not, then wind turbines will always be a fools errand. Reblogged this on How Green Is This?. At the end of the day, all these studies show that wind power has to be backed up by gas/coal/hydro, or whatever power generation. When you add to the mix the amount of “CO2” that was released to build this things, there is absolutely no advantage in even thinking about it!! It doesn’t matter what side of the debate you are on, warmist or skeptic, the maths is just not there! !